Panasonic DMP-UB900 4K Blu-ray player review | What Hi-Fi? The future of home cinema, on disc. A sight to behold. Long story short: Ultra HD Blu-rays are Blu-ray discs on steroids, and the Panasonic DMP-UB900 can play them. Long did we hear whispers of 4K Blu-rays, before those whispers became promises. Then nothing happened, and we began to think that maybe it was all a very cruel joke, that these discs would never see the light of day. At a time when streaming services get stronger and more comprehensive every month, that seemed a strong possibility. The moment has finally come, and it is with great excitement that we confirm the UHD Blu-ray is a real thing. We know that because we’re fondling the discs right now. We’re also fondling the machine that can spin them: the Panasonic DMP-UB900 – the first dedicated UHD Blu-ray player. What is a UHD Blu-ray player? Pretty much as it sounds: a Blu-ray player, but one that spins 4K discs. That means it puts out a picture with a maximum resolution of 3840x2160, and in high dynamic range (HDR) to boot. It handles the Rec. 2020 (very wide) colour space, capable of reproducing colours not displayed on HDTVs, which use Rec. 709. Frame rates go up to 60p, and brightness has a claimed range between 1000 and 10,000nits, where one nit is roughly equivalent to one candle’s light. You get two-channel and 7.1-channel analogue audio, plus optical and coaxial outputs. The internal DAC is capable of handling hi-res files up to 32-bit/192kHz. Compatible formats include DSD, ALAC, FLAC, AAC, WAV and WMA. There are twin HDMI outputs, one that handles video and audio, one that is audio-only. There is an ethernet port for wired connection, although you can also go online with dual-band wi-fi. Network functions include DLNA certification and Miracast, which means you can stream content from a NAS drive or ‘mirror’ the screen of a portable device. You can also go online with apps such as BBC iPlayer, Amazon and Netflix. The latter, as you’d hope, offers 4K streams. Of course, the beauty of physical media is that you can build and play your collection offline, so let’s talk about the discs. UHD Blu-rays look like regular Blu-rays and DVDs before them: 12cm discs with a printed side and a shiny side. Panasonic tells us that anybody who buys the DMP-UB900 will also receive UHD copies of Mad Max: Fury Road and San Andreas. Our test unit came with Mad Max and Pan. These discs – at least these early ones – are multi-format offerings. You get UHD and regular Blu-rays in the same box, as well as a piece of paper with a code for a digital download. UHD Blu-ray boxes are thin and a bit flimsy. It takes little effort to dislodge the discs from the outside, which raises concerns for online deliveries. Let’s hope they fare better than the cardboard ‘snapper’ cases that plagued early DVDs. Setting up, you’ll want to make sure you use the right HDMI input on your 4K TV or projector. It is quite common for manufacturers to dedicate just one or two inputs to 4K viewing. Get the wrong port and you may not get the full UHD Blu-ray offering. Look out for an input labelled ‘HDCP 2.2’. You’ll also need a high speed HDMI cable – there’s one included with the player. We feed the Panasonic with Mad Max: Fury Road (likely to be everyone’s go-to disc for a while because it offers tremendous value as a test disc, far more than the anaemic Pan). The DMP-UB900 loads it up with impressive speed, on par with regular Blu-rays. It takes 30 seconds to get from the disc tray sliding shut to the UHD Blu-ray’s menu appearing, and another 20 seconds to get to the start of the film, past the usual logos and piracy warnings. Navigation is speedy, too. We’re used to Blu-ray players being a chore to navigate, but there’s no sign of button lag here. For the purposes of this test, we use the Panasonic DMP-UB900 with a Sony VPL-VW520ES projector (4K, HDR) and a Samsung UE65JU7000 TV (4K, non-HDR). 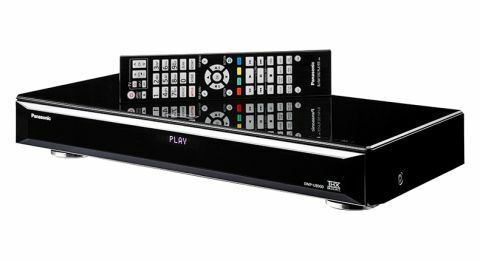 We also bring in a Cambridge CXU, our favourite high-end Blu-ray player. We start with the projector, going all in with 4K and HDR. This is a huge leap above the sort of image quality we’ve been accustomed to – and, as you’d expect, we are a picky bunch. We shall remember this moment, for this is the future of home cinema. Let’s take the colours. Oh wow! The colours. Mad Max is known for its stylised, saturated look, but this kicks it up a notch. Yes, your TV will have a ‘vivid’ mode, but that simply boosts colours to oblivion and offers little in the way of verisimilitude. UHD Blu-ray offers a more diverse and natural range of hues than we’ve seen on any display. Boredom is not an appropriate response to explosions, yet these days we see so many of them it’s sometimes hard to feel excited. UHD Blu-ray remedies this. Every burst of flame is a thrilling event. Explosions look dangerous. No longer are they flat clouds of orange – there are wisps of yellows and red in there too, with flecks of fiery embers burning at varying intensities. The gradations in colour add a dimensionality to the picture that renders 3D almost redundant. The flames are convincing enough that we wonder about the health and safety precautions on the film’s set. On the subject of HDR: there’s a lot of talk about peak brightness, but don’t be confused into expecting a brighter picture overall. If anything, a UHD Blu-ray may initially seem a little darker than a regular Blu-ray – because now there’s no need for the picture to be as bright for you to make out the darker details. You get brighter whites and darker blacks, with more degrees of separation in between. We stare at this picture for hours, yet we are endlessly impressed by the contrast on offer. Bright areas – the sunlight glinting off the hood of a monster truck, for example – sparkle enough to make you squint. And yet, in the same frame, the DMP-UB900 reveals a huge amount of shadow detail in the darker areas, like the dirt on the truck’s undercarriage. Detail levels are astounding. There’s plenty of dirt, blood and sand in the film, and it is all rendered with the sort of sharpness and clarity that almost makes us feel we’re viewing the picture through magnified lenses. There’s little in the way of compression or motion artefacts. We do love our Netflix 4K, but the UHD Blu-ray appears to be miles ahead. Its definition offers a solidity and stability that has yet to be achieved by streaming. How does the 4K HDR image compare to a Full HD? We load a regular Blu-ray of the same film into a Cambridge CXU. We’ve already mentioned it is our favourite high-end Blu-ray player but it bears repeating, because it is stunning. It just goes to show that context is key. Normally we’d swear by the Cambridge and its ability to wield a 1080p picture with gusto, but it simply is no match for the Panasonic DMP-UB900 armed with UHD Blu-ray. The regular Blu-ray is noticeably reduced. Everything is less clear. Textures are less defined. Contrast is weaker and colours are flatter. The difference is less stark when we move from the 4K HDR projector to a Samsung UE65JU7000, a 4K TV without HDR. But it is still a big jump in clarity and definition. And even without HDR, we note the UHD Blu-ray offers strong contrast. Time for a bit of upscaling. The Panasonic proves itself to be up to the task, as Blu-rays are rendered with good detail and little noise. Motion suffers a little, however, with motion artefacts introduced. It’s the same deal with DVD upscaling – surprisingly good definition, at the sacrifice of motion stability. It’s a worthwhile trade-off, however – the motion is never problematic enough to interrupt your enjoyment of what you’re watching. The picture is bright enough and the colours, while not up to HDR performance, are solid. You’ll still need a 3D-compatible 4K TV to see the effect, mind. It’s business as usual for the sound department, which has not benefitted from the same radical overhaul the picture has received. The UHD Blu-ray specification includes Dolby Atmos sound. If you don’t have an Atmos set-up, you’ll get the Dolby TrueHD 7.1 soundtrack. The DMP-UB900 is a fine-sounding device, consistent with our expectations and experiences of a Panasonic’s Blu-ray players. What you get, then, is a rich, weighty delivery. It could be more agile and expressive, compared with the Cambridge CXU, but at no point do we feel the Panasonic’s sound is lacking. There’s a good sense of scale and no shortage of power. Sound effects are clearly and deliberately placed, and delivered with enough dynamism to grab your attention. If you want to be entertained, this will do nicely. We will admit to being very nervous for the Panasonic DMP-UB900. It is not easy being the first of a new breed. Not only does it need to perform well, it has to do so with the distinction required to thoroughly advertise a new format. As far as we’re concerned, it’s mission accomplished. What the Panasonic DMP-UB900 has shown us is the future of home cinema: a magnificent picture with startling clarity, gorgeous colours, and contrast strong enough to defend itself against online streaming opponents. UHD Blu-ray has arrived and Panasonic has delivered a devastating first blow. Your move, Samsung.